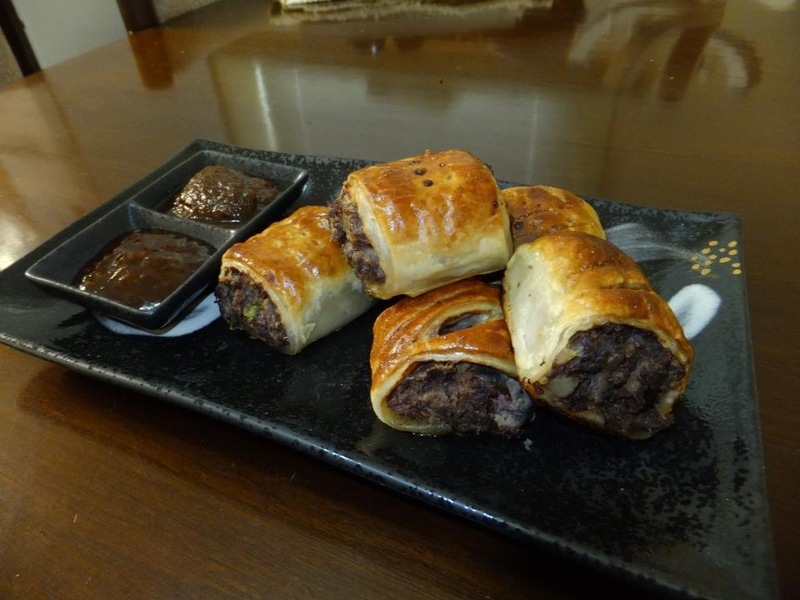 Ever since I was young my Nan used to cook us her amazing sausage rolls using beef or pork. I minced some venison and took it over to her to see what she could do. They turned out great! Boil potatoes and mash. Dice onion and add to the mashed potatoes whilst warm. Add the Venison mince uncooked. Add chopped parsely and thyme. Also add 1.5 tsp of salt and 1tsp of ground pepper. Mix thouroughly by hand. Roll into lengths and wrap with puff pastry. Seal the pastry with and eggwash or water. Cut into desired lengths. Either peirce or make a couple of cuts on each sausage roll. Brush each with an egg wash. Cook in an oven at 200deg for 15 mins then turn down to 180deg for a further 15 minutes. Enjoy! This entry was posted on April 21, 2013 by gourmetandy in Recipes and tagged Deer, gourmet, grandma, hunters, mince, recipe, rolls, sausage, venison.